There’s no question that the geoduck turns heads wherever it goes. It’s big, it’s alien, it’s elephantine, it’s borderline obscene. It’s also prized by diners as a rare, high-end treat. Geoduck (pronounced “gooey duck”) is a large burrowing saltwater clam, with delicate, sweet meat and a crisp texture that makes it perfect for raw preparations like crudo or sashimi. It’s also popular in Asia for hotpot. Just keep in mind that geoduck will toughen when it’s cooked, so a quick blanche is all you need. Given its high market value (about $100-150/lb in China), cultivation of geoduck has soared in Washington and British Columbia. 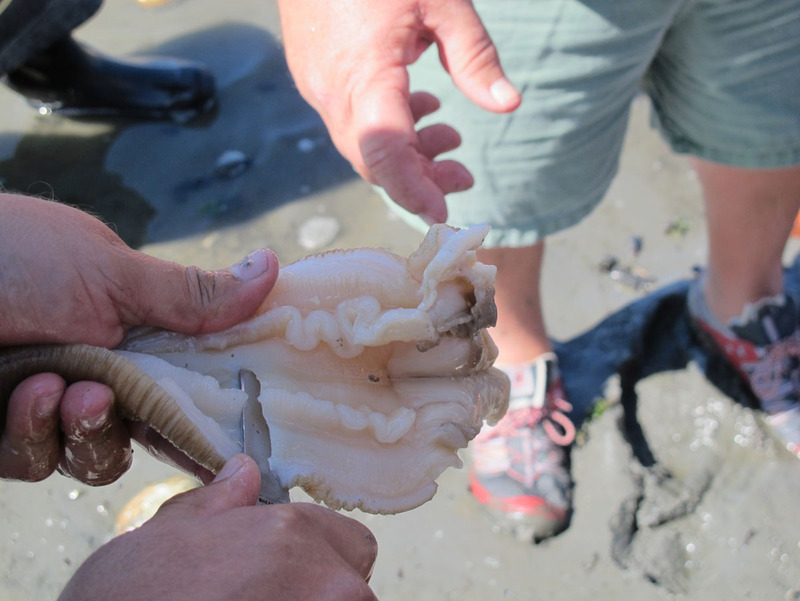 The price reflects the high demand and low supply for geoduck. It takes 6 years to raise a geoduck to market size, and while an adult geoduck has few predators besides humans and can live for over 100 years, the mortality rate for juvenile geoducks is quite high. 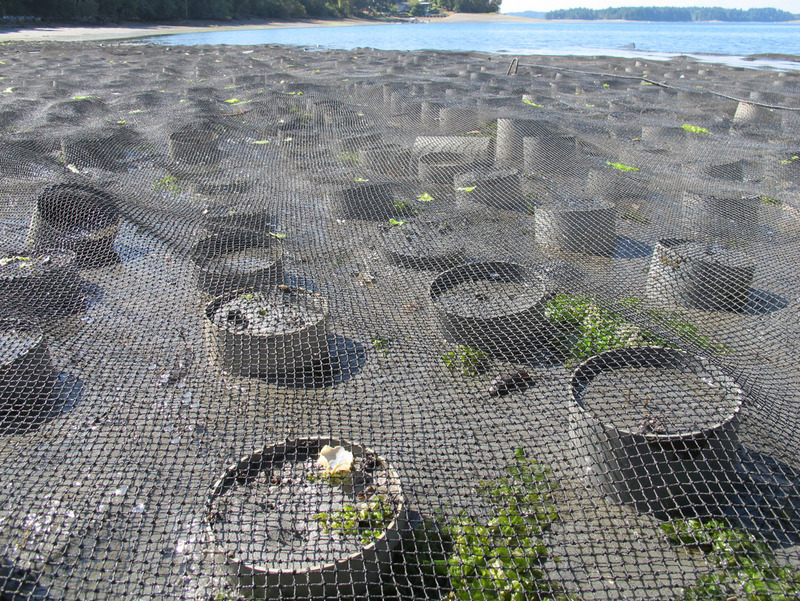 Similar to the FLUPSY for oyster and clams, Taylor Shellfish developed a nursery for geoducks which contains hard-packed sand for burrowing. 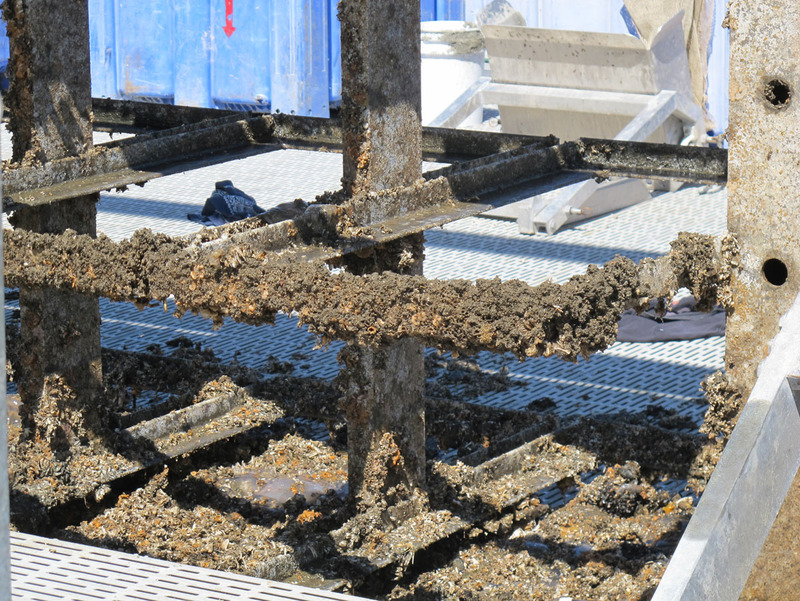 These racks are lowered into nutrient-rich water and the geoducks can grow and be monitored regularly. On this day, the racks were being cleaned. When you examine one closely, you can see that there’s plenty of other sea creatures in the rack besides geoducks, including predators like starfish. 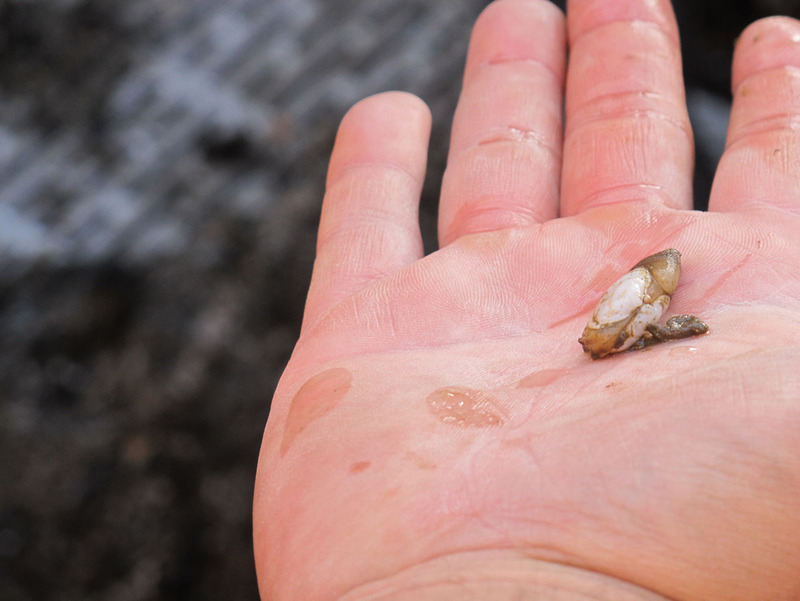 At this stage, the geoduck is about the size of a quarter, with a tiny siphon and thin shell the size of your fingernail. 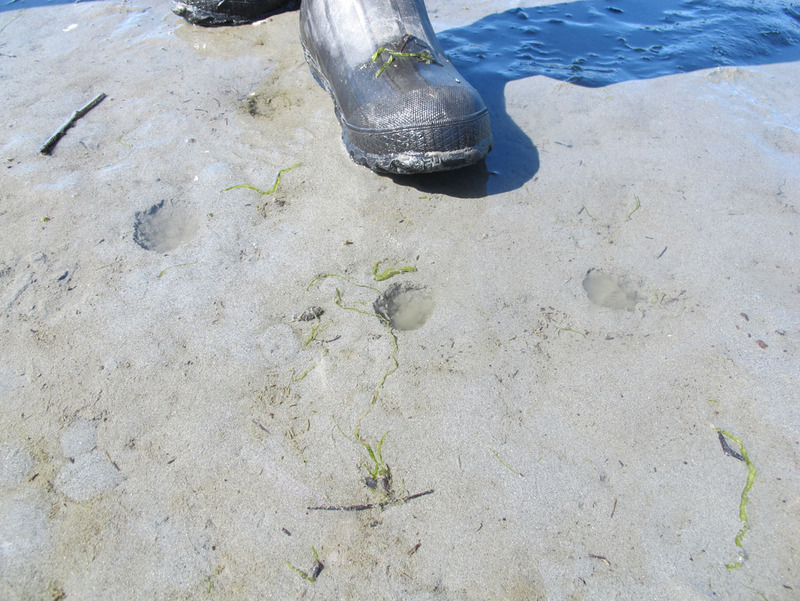 After the geoducks leave the nursery, they are planted on the beach, where they’ll spend the next few years growing out to market size (1.5-2 lbs). 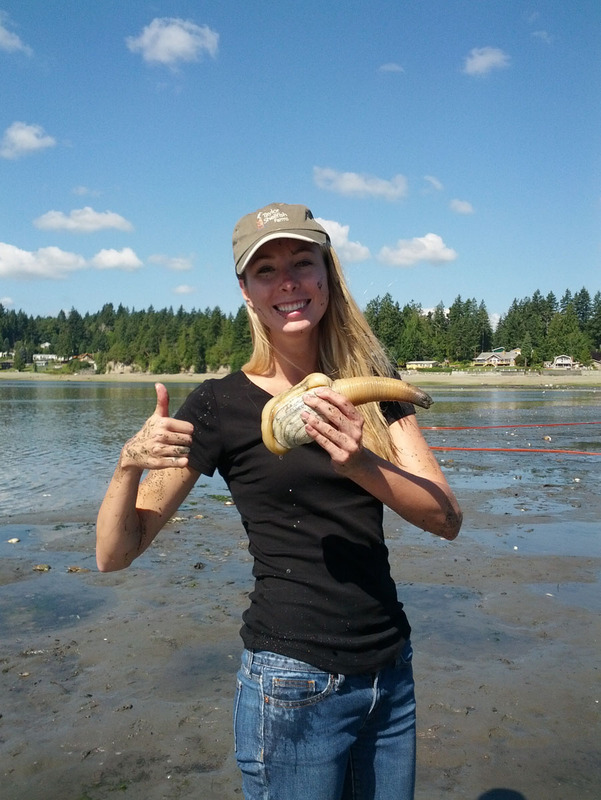 To give them protection, PVC pipes are planted into the sand, and about three geoducks are placed inside each one. The pipes are then covered with netting to ward off predators. After one or two years, the pipes and netting will be removed. On average, only one geoduck will survive to adulthood. When it comes time to harvest geoducks, it’s a messy business. 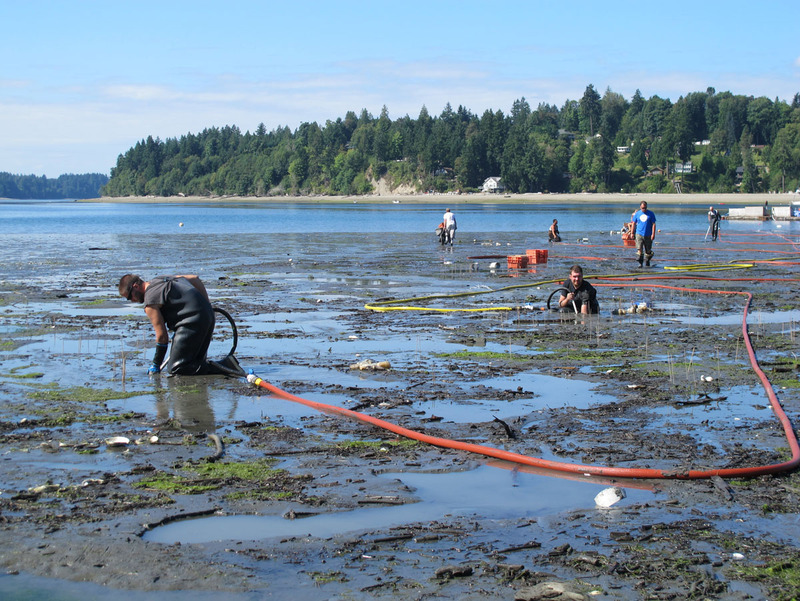 So messy that geoduck digging was featured in an episode of Dirty Jobs. Since the geoduck is buried underground, you must excavate a pit to stand in. Sometimes people use walls or tubes to stop the walls of the pit from collapsing. 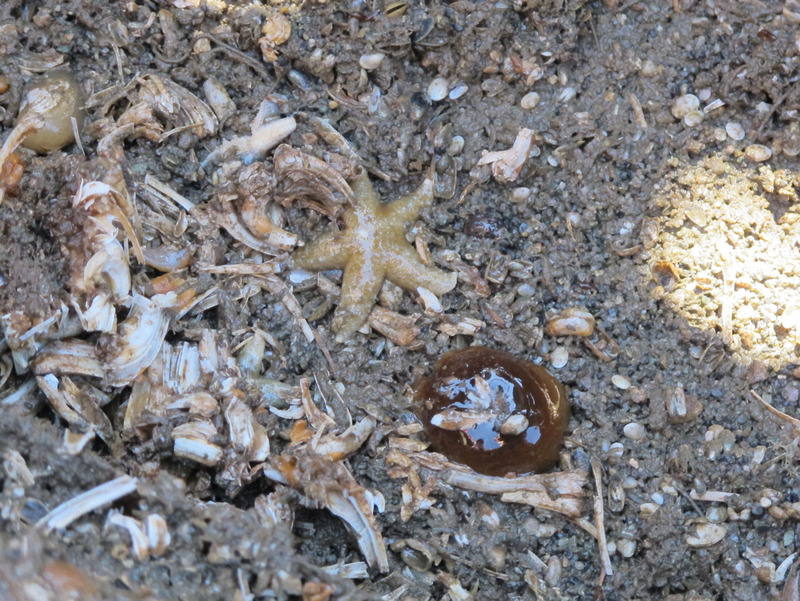 Next, look for small holes in the ground, an indication that a geoduck is buried underneath. Geoducks are filter feeders, sucking plankton in through one tube and expelling waste out of another tube. So if you see a circular dimple in the sand, there’s a pretty good chance that a geoduck has been squirting out water from that opening. Armed with a water hose, aim the nozzle diagonally toward the siphon hole, two or three feet below the surface. Essentially, you’re trying to spray water toward the body of the geoduck, loosening the sand enough so that you can grab the shell and lift it to the surface. Long arms are definitely a plus. Be careful not to yank on the siphon itself, or it will break off. 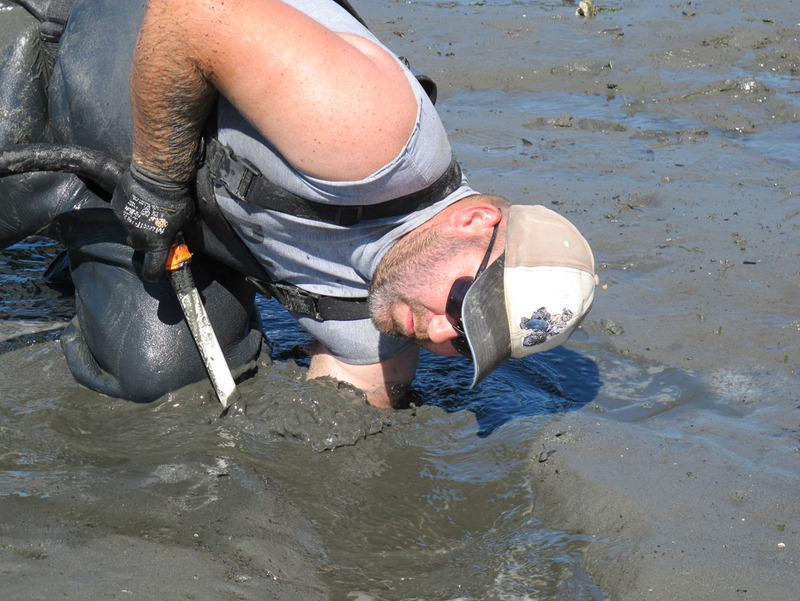 For experienced diggers, you can pull geoducks up quickly and smoothly without too much of a mess. You might even sing “The Geoduck Song” while you’re working. 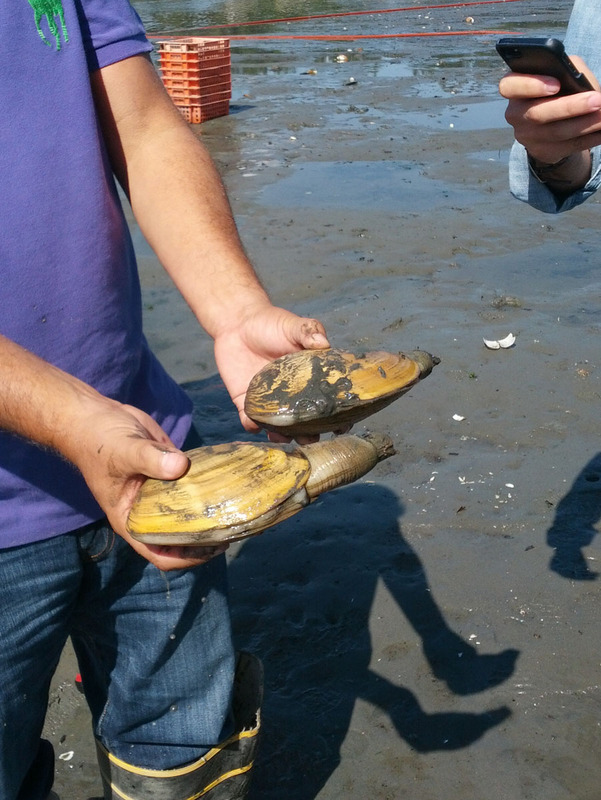 Occasionally, instead of pulling up a geoduck, diggers find horse clams. These are similar to geoducks and commonly used a substitute in cooking, but they don’t ship as well as geoducks so they aren’t farmed. They flourish under the same conditions as geoducks though, so oftentimes farming geoducks means you’re also sheltering and raising horse clams. 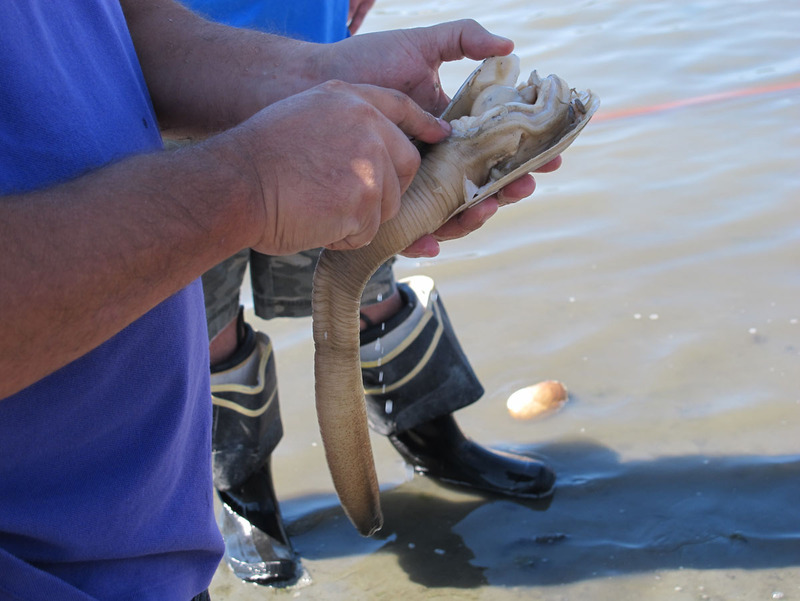 To tell the difference between a geoduck and a horse clam, feel the tip of the siphon. A horse clam will have a firm ring on the end of its siphon while a geoduck will not. With our hard won prize, we began cutting the siphon and back of the geoduck away from the rest of the shell. To remove the skin of a geoduck, you can blanche it in hot water for about 5 seconds, then peel off the thin layer of skin surrounding the siphon, revealing pearly white meat. We sliced the siphon into thin pieces and passed them around. Crisp, sweet, briny—it’s hard to beat raw geoduck right on the beach. So, if you ever have the opportunity to “dig a duck,” jump into the mud and enjoy the hunt!